A family put in temporary housing in Bristol 13 years ago have been the subject of an incredible outpouring of love and support after council housing chiefs decided they needed to move home – across the city. So huge was the messages of support from neighbours, friends, work colleagues and local schools that Bristol City Council reversed a decision to move Nimo and Nor Subayr, and their family. The family came to Southville as refugees from Somalia and back in 2004 were placed in temporary housing, with the promise that something more permanent would soon be found for them. But nothing happened for a few months, so Nimo and her family got on with building new lives in Southville. The mum of seven got a job at the local Southville Primary School as a dinner lady and after-school cleaner, but quickly became indispensable to, and much-loved by, both colleagues and other parents. Then, earlier this month – some 13-and-a-half years later – Bristol City Council finally told the family they had found a permanent home for them, even though they thought they already had one. The problem was that it was on the other side of the city – and housing officers told them that if they turned it down, they could end up being classed as “intentionally homeless”. That ultimatum, giving them just three weeks to decide, sparked the local community into action. Neighbours and friends began writing to council chiefs, and bosses of both Ashton Park School – where some of Nimo’s children attend – and Southville Primary, where Nimo works, wrote letters demanding a U-turn. 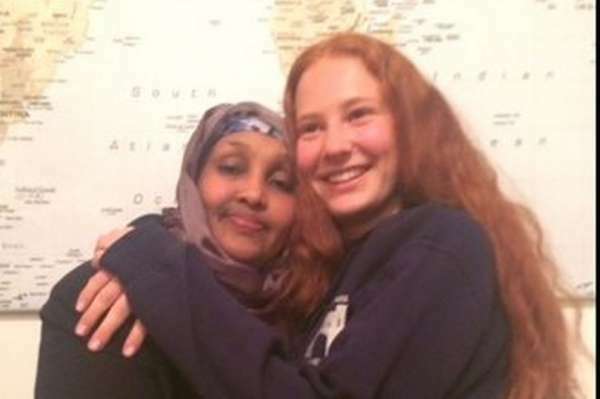 But that was nothing compared to the outpouring of support from people signing an online petition to Bristol Mayor Marvin Rees, set up by 15-year-old neighbour Afra Parsons. “When they first moved in, Nimo and Nor barely spoke English but they quickly assimilated into our neighbourhood and community,” said Afra. “The seven children went to the local Southville Primary School and, when her youngest child started school, Nimo was employed by the school, where she quickly became beloved by children, parents and teachers alike. “Thirteen-and-a-half years later, they are now an integral part of our community. They have always gone out of their way to be friendly and neighbourly, and are good neighbours to everyone on the street. “They are just generally the nicest and friendliest family to have around, and are an absolute asset to our community. Jessica Tucker was one of scores of supporters calling for a council U-turn as word spread of the campaign. She said she grew up opposite the family. Wendy Giles, a former parent at the primary school, demanded the council re-think. Liz Ellis said the family ‘made us all better people’ in Southville. “Don’t make the family go to another area – we need them all here,” she said. And Claire Bowman was also among hundreds who signed the petition with messages of support within hours of it going online. Local Green councillor Charlie Bolton got involved, and called on housing portfolio boss Paul Smith to intervene. Faced with a barrage of love for the family and demands that they be allowed to stay in their ‘temporary accommodation’ in Southville, the council relented. “We have withdrawn the offer of the St George property and will offer it to a homeless family,” said a council spokeswoman. “We are working closely with the family to make sure they have a suitable long-term home.